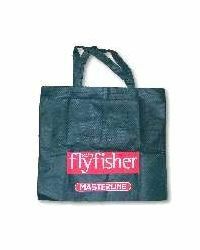 ✔ Bass bag is printed on the side with the Logo's of Masterline and Today's Flyfisher magazine. ✔ Trout sized: 17" x 15"
A dark green Bass Bag from Masterline made from the same durable, high tech material as our John Chapman bags but in a thinner fabric.. This bass bag is printed on the side with the Logo's of Masterline and Today's Flyfisher magazine. Good quality - easy to fold up & carry in a fly vest.